The bright star Sirius (which does not appear quite this bright to the naked eye) is visible in the southern sky this week, around 9 p.m. local time. Step outside this week around 9 p.m. local time and look about one-third of the way up from the southern horizon, and your eyes will be met by a dazzling celestial solitaire: Sirius, the Dog Star. It is located in the constellation Canis Major, the Big Dog, and is shown on most star maps as fixed in the dog's nose (although in his 1954 book "Find the Constellations," author H.A. Rey refers to Sirius as "a remarkable dog tag"). The star rises soon after and slightly south of the constellation Orion. Canis Major itself is a fine constellation composed of a number of bright stars, three of which form a very distinct triangle that marks this celestial canine's hindquarters. It is said to be one of two dogs — the other being Canis Minor, the Little Dog — both belonging to Orion, who is leading his faithful companions across the sky. All through the long winter nights, Sirius glitters. On New Year's Eve, as we make the transition into the New Year, it appears due south at midnight. At magnitude minus 1.46, it's the brightest fixed star in the sky. Only the sun, the moon, Venus and Jupiter (and on rare occasions, Mercury and Mars) appear brighter than Sirius. In his invaluable "Celestial Handbook" (Dover Publications, 1978), Robert Burnham Jr. writes of Sirius: "To Americans the coming of Sirius heralds the approach of the Christmas season and conjures up visions of sparkling frosty nights and snow-laden fir trees." In color, Sirius is a brilliant white with a definite tinge of blue. Its name appears to be derived directly from the Greek word for "sparkling" or "scorching." One of the first things we notice about the stars is their twinkling. This is caused by the unstable state of the air through which their light must pass to reach our eyes. Especially near the ground, the air is almost always turbulent; warm and cold currents mixing together can produce an effect like the "heat waves" seen along a highway on a warm summer afternoon, which can cause the scenery beyond to blur and quiver. On some nights the twinkling effect can be spectacular (though terrible if you're trying to get steady views through a telescope). On such occasions, especially near the horizon, the brightest stars seem to splinter momentarily into the various colors of the rainbow. Sirius flashes such prismatic colors in just such a remarkable way. You can see this for yourself this week if you look very low toward the southwest horizon at, or shortly after, 1:30 a.m. local time. You can then catch Sirius just before it sets, and, as Martha E. Martin wrote in her book "The Friendly Stars" (1907), you can watch Sirius, "twinkling fast and changing with each motion from tints of ruby to sapphire and emerald and amethyst." This week, around 9 p.m. local time, look for the star Sirius in the southern sky. Sirius was also the Nile Star of the early Egyptians. When they saw it rising just before the sun, they knew that the Nile River would son overflow its banks and add to the fertility of their lands. But in North America, we refer to the first visibility of the Dog Star as the end of the "dog days," instead. During those sultry days of July into early August, Sirius is invisible due to its proximity to the sun in the sky. It was once thought that the closeness of the brightest star of the night relative to the brightest star of the day combined to make for the oppressive heat that would often be experienced at that time of the year. Traditionally, the dog days run from July 3 through Aug. 11. Sirius begins appearing low in the southeast sky through the bright dawn twilight, rising about 4 minutes earlier each morning thereafter. Those sticky, sultry days are, of course, far behind us now when the Big Dog is so prominent in our early evening sky. 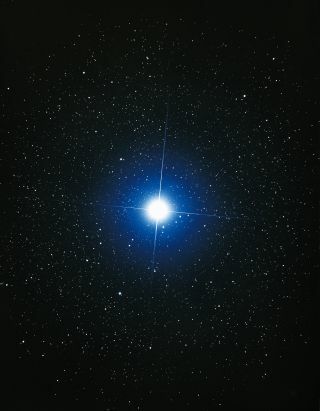 At a distance of 8.6 light-years, Sirius is the fifth nearest star known, and among the naked-eye stars it is the nearest of all, save for Alpha Centauri. In the course of a thousand years it changes its place in the sky by as much as 0.37-degree, or three-fourths of the apparent diameter of the moon. (Read more about measuring distances on the sky here.) But instead of moving forward in a straight path as a single star would do, it is tracking through the sky on a wiggly path. Even as far back as 1834, astronomers speculated that Sirius must have a companion that was pulling it off course. In January 1862, noted telescope maker Alvan G. Clark first saw that companion, known as Sirius B — sometimes called "the Pup" — the star responsible for the wiggle. Sirius B is a white dwarf star, only one ten-thousandth as bright as Sirius A. Later calculations have shown that A has just over twice the mass of our sun, but B amounts to slightly more than one solar mass. Since it is so small, B must be exceedingly dense; in fact, it packs 102 percent of one solar mass into a body that is a little less than the diameter of Earth. To do that, Sirius B must have a density more than 90,000 times that of the sun. Incredibly, if it were possible to somehow transport a teaspoon of this star's material to Earth, it would weigh more than 2 tons!